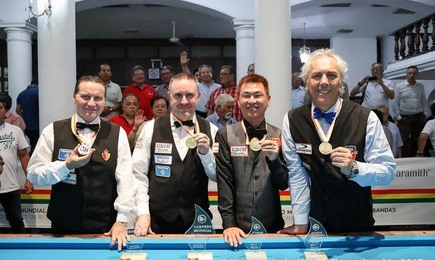 HÀ NỘI — Mã Minh Cẩm of Việt Nam secured a bronze medal at the Three Cushion World Championship, which ended in Santa Cruz, Bolivia, on Sunday. Cẩm, who was the first ever Vietnamese to participate in the world tournament’s last four rounds, lost to Eddy Merckx of Belgium in the shootout after a draw of 40-40 in their official innings. The match saw an up-and-down score for both rivals. Cẩm, world’s No 23, sprinted away from the start, made 11 in his third inning and went into the break 21-4 ahead. But after the stop, Merckx, No 11, came back. He started with three runs of six in a row, forcing Cẩm stably on his chair, and the Vietnamese lost control over the game. Merckx continued with his peak performance and closed to take the win to 39-31. Cẩm, however, came with a revival. He scored eight points in a row to level at 39-39, before missing out on the last point. Merckx finished with one point, and Cẩm forced the two sides into a draw with another point. The shootout was also as tense as the official game. It was a battle of the nerves. Both of them started the penalty with two and missed their third. It was 2-2 for the first shootout. In the second, Merckx ran three points in a row, while Cẩm could make the break shot but missed the next one. The Belgian took the overall win after a 3-1 shootout win. Merckx, however, failed to lift the trophy for the third time after losing 16-40 in nine innings to Frederic Caudron in an all-Belgian final later in the day.